Opportunity Works initiative. Led by JFF in collaboration with the Forum for Community Solutions, the initiative works to bring together a cross-sector collaborative in specific communities to improve outcomes for young people, with special attention paid to those who are homeless, and in or transitioning from the foster care and/or juvenile justice system. 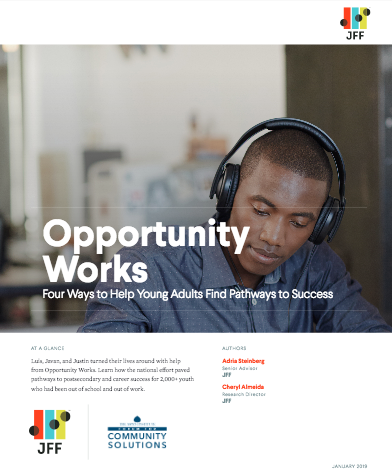 Opportunity Works is based on the organization’s “Back on Track” model to reconnect opportunity youth. The initiative supports seven communities (Boston, Hartford, CT; New Orleans, LA; Philadelphia, PA; San Francisco, CA; Santa Clara, CA; and South King County, WA) to reconnect opportunity youth with education and employment on-ramps and pathways that dramatically improve their life trajectories.